What Impresses a SharkTank Shark? Julie Busha had the answer. It takes a lot to impress the “Sharks” on Shark Tank, the popular television show where entrepreneurs pitch their business ideas to successful millionaires and billionaires in hopes of bringing them on as investors and partners in their businesses. 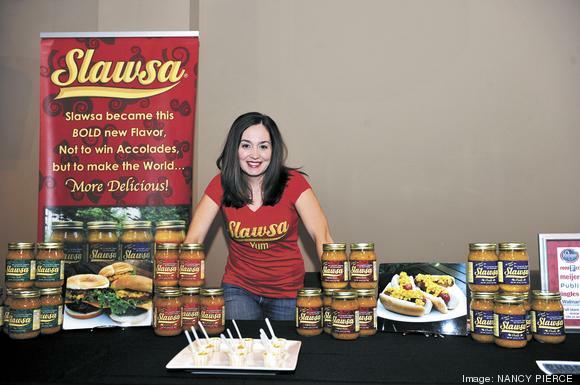 When 35-year-old Julie Busha shared her product line, Slawsa, a unique condiment that is a cross between salsa and coleslaw, the judges not only loved the taste but they were clearly impressed by the fact that she was willing and able to forgo a salary in order to funnel all sales proceeds into the growth of the company. She was able to do that because she funded the company entirely from personal savings. In fact, when the opportunity came for her to buy Slawsa from her former partner, per his request, she was able to do so without getting a loan. She had set aside a nice nest egg from the decade she spent as a sports marketer, primarily in NASCAR, and says she dug into her savings to finance much of the start-up costs: production, travel to pitch retailers, marketing, legal costs and more. “It’s not cheap to start a company, especially in an industry as highly competitive as the grocery one; it takes a special effort” she says. Billionaire Shark Tank investor Mark Cuban was extremely supportive of Busha telling her “you’re an example like we rarely have in here and I’ll be a customer for life.” Cuban also expanded after she left the room, “The fact that she scrimped, has no debt, pays off her credit cards, saved up enough money to invest into this company and buy him out is such an amazing example for everybody.” Fellow Shark Robert Herjavec also shared supportive comments about Busha’s work ethic. When she secured a coveted spot on Shark Tank, Busha had to ramp up production to meet the expected demand the show would generate. She and her husband borrowed equity from their home to fund that. Her strategies for funding are found in my book Finance Your Own Busniess: Get on the Financing Fast Track and this content is copyrighted from that book.